Not only wider, but also faster. If there was one thing Dodge Challenger SRT Hellcat owners wanted more of was grip. And today Dodge has obliged. Meet the Dodge Challenger Hellcat Widebody. 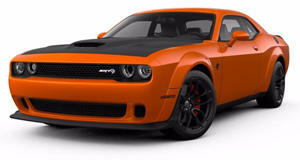 Powered by the same 6.2-liter supercharged Hellcat V8 with 707 hp, the new Widebody version adds 3.5 inches of width thanks to those fender flares, also featured on the new Challenger SRT Demon. There also new 20 x 11-inch "Devil’s Rim" split-five spoke aluminum wheels riding on new Pirelli P-Zero tires with a new tread pattern. Other visual changes include the Demon’s front splitter, a new grille, and Air-Catcher headlamps. There are also six-piston Brembo brakes with 15.4-inch calipers. Hellcat fenders badges and a raised Hellcat badge on the rear spoiler let everyone know you’re not driving the typical Challenger. For the first time on a Hellcat model, Dodge added a new electric power steering system with SRT Drive Modes providing selectable steering tuning. Those settings can be displayed on the 8.4-inch touchscreen. Not only does this Widebody styling look fantastic, but it’s also faster than the regular bodied Challenger Hellcat. Dodge claims the Hellcat Widebody delivers a lap time, on a 1.7-mile track, lowered by about 2 seconds per lap, which translates to approximately 13 car lengths after one lap. Quarter-mile performance has been improved by 0.3 seconds: 10.9 secs vs. 11.2 secs. Furthermore, lateral skid pad grip increase by 0.04 g, and 0-60 mph improved by 0.1 seconds. Top speed has been clocked at 195 mph. There’s a total of 15 exterior colors to choose from, however B5 Blue, F8 Green, Plum Crazy and IndiGo Blue won’t be available until a later date. Pricing? A 2018 Dodge Challenger SRT Hellcat Widebody begins at $71,495, not including a $1,700 gas guzzler tax and $1,095 destination fee. This pricing also includes a full-day session at the Bob Bondurant School of High-Performance Driving in Chandler, Arizona. Dealers will begin taking orders in July and the first deliveries are expected before the end of the year.